A few weeks ago, I wrote a blog post as a letter to past me. If you want to read it, click here. Spoiler: One of the things I said in the post was that I wished I'd joined Twitter sooner. (Let's pretend for a minute that my hoards of adoring commenters all asked for me to expound on that statement. This did not actually happen, but it makes me sound cooler.) 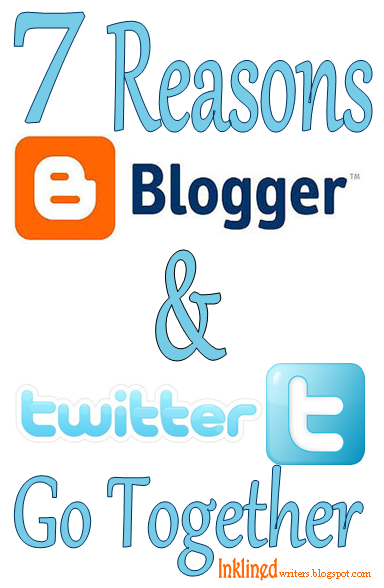 Because of the hoards of adoreing commenters asking for a follow up post to that statement, here are 7 Reasons Bloggers and Writers Should be on Twitter. 1. Twitter is a great place to connect with readers! On the rare occasion that one of you deem my blog post good enough to tweet about, it makes my day! It makes me want to flip back-flips (but unfortunately I spent my childhood reading, not on the tumbling mat.) If you join twitter and start tweeting about your blog, you'll be surprised how many pageviews you get from those two or three tweets. In the past month, I've gotten at about 30 hits from Twitter, or about one a day. That may not sound like much, but you never know the difference one reader can make. 2. Everyone is semi-equal on Twitter. While yes, Twitter accounts like JK Rowling's probably get more hits on a daily basis than I do, if I send a tweet to Rowling, it shows up on her account the same way it would it she sent a tweet to me. We don't have to be friends. We don't have to know each other at all outside of Twitter. It's wonderful. 3. Twitter can be a good marketing tool if and when you publish that book. If you read this blog, chances are you plan on becoming a published author at some point in the future. Twitter, in my opinion, is one of the best ways you can advertise your book! And if you get to understand confusing things like hashtags and Retweets now, when it's time to start promoting your book on Twitter, you'll be all the more ready. 4. Twitter is a good place to met and engage with bloggers you look up to. Two bloggers I really look up to are Cait from The Notebook Sisters and Stephanie Morrill from Go Teen Writers. Bother of these writers probably knew of my before Twitter, but I really feel like connecting with them on Twitter helped strengthen my relationship with them. 5. Twitter is a great platform to show your support for authors and start getting to know them. Say you have an authors that you look up to. Maybe you even think they'd be the type of author to read your first book and write that glowing comment publishers seem to love smattering over the back cover of books nowadays. If you start promoting and interacting with that author now, they might have a more friendly idea of who you are. They might even tweet about you one day! 6. Twitter is not as time consuming as many other social media sites. I don't know about you, but between Pinterest, YouTube, and Facebook, I can spend a lot of time on social media. But while I love Twitter, I find it harder to get sucked in. Maybe it's the unique interaction of 140 characters, combined with Favorites, Retweets, and Hashtages, but Twitter seems like it was built for people in a time crunch! You can easily spend on 10 minutes a day on Twitter and still have a lot of interaction and fun! And that leads me to my last point, that Twitter is just plain fun! Even if you only spend 10 minutes a day on Twitter, you can learn the lingo, get to know and connect with some of your favorite authors, and give shout outs to bloggers you admire. Twitter is fantastic, and all around, I see no reason not to join! Do you have a Twitter account? Are you going to get one now? Either way I'd love to see the link to your twitter in the comments. It would be my honor to follow you. My mom didn't let me have one until my youth pastor talked her into it. Maybe have her read this post? My parents don't allow me to have one, but I wish too... ;-) Stephanie and Cait are both great writing relations! Love them both. Those ladies are so awesome, aren't they! Maybe your parents will let you on Twitter if you show them this post. Best of luck and thanks for commenting. Great list, Sarah! As you know, I do have a Twitter account but I took a break from using it for a while. Too much social media can get overwhelming. I'm starting to get back on Twitter now, though! By the way, I just realized that Covers and Ink is listed on your list on the right. I'm honored that you included my blog. Thanks so much! I feel you, about social media! I've loved it this summer, but I don't know how I'm going to deal with it after today. School starts tomorrow! My Favorite Blogs list has a few blogs that I really like. It updates itself with the 5 latest blogs to post, so sometimes your blog will be listed there and sometimes not. But either way, it's my pleasure!! Glad to have helped! :D Thanks for reading. Thanks for the info! I've considered getting a Twitter but wondered if I should wait till I had something published or just get one now. I think I said it in my post, but it bears repeating. If you get one now, you will better understand the way Twitter works when it's time for you to use it as a published author. Plus, you might make Twitter friends that can help you promote your book! Loved this post! And reason #6 is so true - I like Twitter's succinctness, and quick pace. I do believe Twitter is my favorite social network at this point!